A lady called the vet practice a few days ago because her son was very distressed about their pet guinea pig. He had just discovered the guinea pig was paralysed in its back legs. She could not bring in the pet until the next morning and had serious financial constraints. When you continuously hear this scenario, you start to think this is already looking like a grim one. However, you must never assume the outcome of the situation as the information communicated over the phone may be very different to the one in the consultation room. 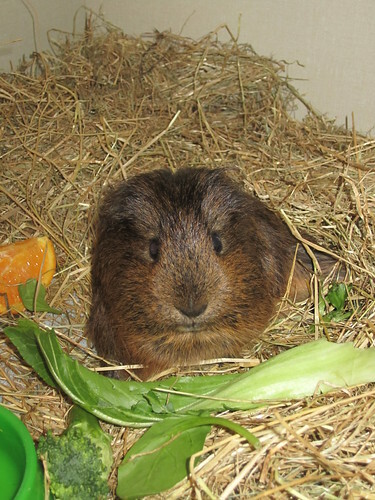 We scheduled the earliest appointment available to check this poor little guinea pig named ‘Brownie’. The owner walked in with a newborn in her arms and a toddler on her side and I immediately held my breath. In my head I was thinking this meant heaps of opportunity for the guinea pig to have been dropped causing traumatic injury to the back or pelvis. I then proceeded to lift this tiny brown hairy guinea pig out of its cage. As soon as I held it in my hands, I felt its back feet loosely flop down underneath it. Suddenly the gravity of the situation really hit me and my worst fears were coming to life. I immediately started pinching this guinea’s tiny feet to check if it has any deep pain in its back legs. Fortunately it did and it was so full of spark. I discussed workup costs with the owner and had to give a very guarded prognosis. The owner blatantly said she had a few young children and could not afford the costs of workup. I met her half way and said I would x-ray the little one free of charge to see if we must immediately do the kinder thing and put it down. If no major lesions were detected on x-rays then we should trial it on anti-inflammatories and stick it in a hopsital cage to see if it responds. Thankfully, the owner gave me the green light. I proceeded with x-rays and we could see that it had a narrowed space between its thoracolumbar junction. We suspected a traumatic disc prolapse. We gave it anti-inflammatories and put it in a cage and put in lots of fresh greens and water. ‘Brownie’ got into the food like there was no tomorrow. Check out how cute and bright he was in his hospital cage. Unfortunately with spinal cases, you require patience and lots of perseverance and dedication. The owner surrendered the guinea pig to us today because she can not afford the workup or even provide it with the after care required. My vet team has fallen in love with ‘Brownie’. Alana and I had stacked up heaps of fresh greens for him from home this morning and were competing with feeding him breakfast. Chris gave him a lovely bath and prepared a very comfy bed for him. Erin took him home as she is equipped with two spare hutches and is a major guinea pig enthusiast and owns two of her very own. Amy dressed him up and even made him a lovely cape with the letter ‘P’ engraved on it because she has renamed him para-pig. Check out the footage of him taking a bath and then a glimpse of his hind leg issues. In this video, I am giving him a physiotherapy session and he was not very comfortable at first. We gave him treats and that worked a treat. It was so hilarious watching him swallow this leaf of spinach. We are all already very attached to this little brown creature that has so much personality. He head butts you, enjoys being cuddled, eats out of your hand and is just a joy to have around. We are all trying to be very realistic but it is easier said then done. Let us hope all our efforts and his willingness to keep going will pay off in the end. I will keep you posted on how he goes. Keep us posted on Brownie’s progress! I totally connect with what you are saying about pocket pets. Many owners would rather just got a new one then fix the old one. We, vets, always try to waver fees and discount heaps to encourage owners to do the right thing by their pocket pets. Fortunately, we have also had such amazing dedicated clients that have paid tons of money to get their pets right. Only last week, my colleague repaired a fracture in a pet bunny. We have had a number of rats over the years. They are the most amazing little animals. I work part-time as an educator in a zoo, and I spend a great deal of my time explaining to folks that when they get an animal as a pet, it’s forever. And quality vet care is part of the package. I am so glad that Christopher “Brownie” Reeves is doing so well! We’re pulling for him over here in the USA! Awe poor Brownie. We hope he gets better. Thanks heaps. So far we are saying little improvement each day!!! What a nice story. A good outcome. He is so cute. Brownie is so cute, no wonder you fell in love with him. I think he liked the bath – it must have been nice and soothing for him! I hope he continues to improve, but please keep us posted. Brownie did love his bath :-). He managed to stand on his tiny back feet today. That makes us feel so hopeful. I will definitely keep you posted. I totally agree if you give a rat, chicken, pig, or any creature half a chance, you would be surprised how much they can touch you with their sincere beautiful nature. :-). Brownie’s going really well so far, eating heaps, getting his physio and he may have even managed to attempt to put weight on his backlegs for the first time today! I hope in a few weeks, I will be able to upload pics of him running around. We did not expect Brownie to wolf down that spinach live on video. How cute is that? He loves the lime light and wants to be famous…hehehe. Brownie (or “Christopher Reeves” as I am now affectionately calling him!) is in my care at home at present. He is doing great! His progress is going to be slow, as is expected, but I have faith in him to pull through… God, at least I am hoping like hell he’ll be able to regain his quality of life. Today myself and my partner (who has fallen head over heels in love with him) gave him another bath (because he is soiling himself at the moment as a result of the paralysis) and a physio session. Immediately after, I put him on the floor on a towel and he was able to stand, albeit unsteadily, on his back legs. I can see that he WANTS to use them, but it’s a bit beyond him right now. We have also come to realise that he had worn his top incisors down to the gum, which is making it difficult for him to eat – That would explain his poor body condition, paired with his vitamin C deficiency as he wasn’t receiving enough of the right foods at his previous home. Needless to say, he is making up for the lack of fruit and veg with us – he is an EATING MACHINE!!! But we have to cut most things (like apple, broccoli, carrots and oranges) into strips for him because his lack of top teeth mean that he can’t chew these things properly. As far as his legs are concerned though, he is managing to sit in a more “normal” fashion now, rather than slumped over and twisted up, which was so hard to have to witness. I definitely think he is feeling more comfortable. I’m glad we can also give him drugs to help with that. Lets hope that with dedication, time and patience, we can restore this little trooper’s quality of life. Pocket pets are NOT disposable and they deserve exactly the same amount of love and care and dedication as any dog, cat or pony. I also personally believe that people underestimate how fantastic guinea pigs are as pets and how much personality they have. They’ve got A LOT to offer! Thanks heaps for all the indepth update…so exciting to hear he is positioning himself better. I am glad I was able to hand him over to a very dedicated pet owner/vet nurse that I am confident will give him the best fighting chance to get back on his tiny brown feet. I was very happy that you took on the challenge of looking after him and getting hyperattached well knowing the gaurded prognosis. Thumbs up to that! I also secretly knew that I have automatically placed him in his new home if he makes an excellent recovery ;-)…I can’t wait to recheck him on Tuesday! I really want you to see how he is on those back legs though. But yeh, the vid I thought we took turned out crappy as, so I will get another tomorrow. I don’t want to exhaust the little guy by making him stand too much… he was pooped after his session today. It clearly takes a lot of energy out of him to stand on them at the moment. ok, so sorry just spotted what happed…tragic……we are giving Billie Osteocare and physio, she had a steroid shot as well…..its day 4 now and my heart is aching not sure how this is going to pan out…. I hope Billie is still powering on. Thanks for the last update. Please do tell me how she is getting on now.